For the rest of you, click the following link to read/watch Part 1 of our History of Hurco video series, where we learned about all of the events—good and bad—that led Mr. Roch to start a business with his boss at the time, Ed Humston. To watch/read Part 2 of the History of Hurco, click this link. 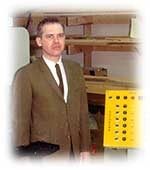 In Part 2, Mr. Roch talks about the first product he invented at Hurco, how the company almost folded within the first two years, and he foreshadows the control technology that would ultimately create CNC machining technology as we know it today. I hope you enjoy Part 3 of our interview with Mr. Roch where he talks about his greatest weakness: "too many ideas for his pocketbook" and gives us insight about the other co-founder of Hurco, Mr. Ed Humston. Mr. Roch also reminisces about his second product introduction, Compu-Cut, and why it wasn't profitable.